Resource center What Is Codeine, and Is It Addictive? 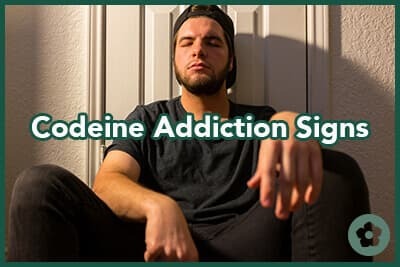 What Are The Signs of Codeine Abuse? As an opioid drug, codeine has a high potential for abuse. It is a habit-forming drug that can rapidly lead to addiction. The NDUH (National Survey on Drug Use and Health) Data Report publishes that 12.5 million adults in the United States misused a prescription painkiller in 2015. Prescription painkillers and opioids such as codeine are some of the most widely misused medications in America, and the NSDUHreports that close to 2 million adults in the United States struggled with addiction involving a prescription pain reliever in 2016. A person may begin with a legitimate and medically necessary prescription for codeine, and then progress to abusing the drug. That being said, the vast majority of people who take the drug do not misuse it. Codeine is, however, a mind-altering drug that makes changes to a person’s brain chemistry. In addition to blocking pain sensations, it can make a person feel good – mellow, relaxed, and pleasant. In higher doses and when misused, codeine can create a euphoric high that may become desirable. 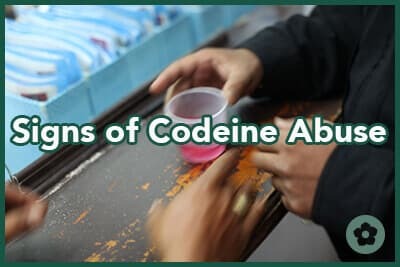 Codeine abuse and addiction can create a multitude of health, social, personal, emotional, physical, financial, legal, occupational, and potentially even criminal issues in a person’s life. Such abuse is optimally treated through a specialized program. Recognizing the signs of abuse can aid loved ones in getting professional help for a healthy recovery. Codeine is a prescription medication that is dispensed as a painkiller and also as a cough suppressant. Codeine is also contained in many combination medications. Any use of codeine that is not medically necessary and under the direction of a medical professional is considered to be abuse. Individuals may take a codeine dose sooner than is prescribed, take more than the intended dosage at a time, or continue taking codeine after a prescription has run out. Exaggerating symptoms in order to get another prescription of codeine when it is no longer necessary is another form of prescription drug abuse. People may go to more than one doctor, called “doctor shopping,” to try and get additional codeine prescriptions for misuse. Altering medications, such as chewing tablets or crushing them to snort, inject, or smoke the drug, is another form of prescription drug misuse. Recreationally, codeine is sometimes used in a concoction that is popularly referred to as purple drank or sizzurp. With this mixture, cough syrup containing the opioid is combined with alcohol or soda, the journal Addictive Disorders publishes. When codeine is being abused, family members or loved ones may notice a lot of empty medication bottles in the trash, medications stashed in easy-to-reach locations, and/or powdered residue on hard surfaces from crushing the pills. Codeine is a central nervous system depressant drug, so when a person takes it recreationally or misuses it, the side effects may be similar to alcohol intoxication. Heart rate, breathing, blood pressure, and body temperature are all lowered through codeine use. Slurred speech, impaired motor coordination, slowed reflexes, lowered inhibitions, increased risk-taking behaviors, mood swings, drowsiness, and altered consciousness may all be signs of codeine use. Abuse of codeine can make a person more prone to get into situations that may be hazardous and to act in a way that is out of character. Questionable and even potentially dangerous sexual encounters may result. Individuals may also fall down more, get into accidents, or become injured due to being impaired by codeine use. Codeine can cause constipation, nausea, vomiting, abdominal cramps, and loss of appetite, so changes in weight, eating, and bathroom use patterns may be evident in someone abusing codeine. Other signs of codeine use can include itching and skin irritation, nodding off, sleeping more than normal and potentially at irregular times, clammy feet and hands, vision changes, short-term memory issues, trouble concentrating and focusing, and struggles with anxiety and depression. When a person uses or abuses codeine, brain chemistry changes, and this can lead to physical dependence. This occurs because codeine interacts with levels of some of the brain’s naturally occurring chemical messengers, such as dopamine. As a neurotransmitter, dopamine tells the body when to feel good and is also involved in some memory, sleep, and thinking functions as well as movement abilities. Codeine increases the level of dopamine in the brain when it binds to opioid receptors. This is what causes the mellow and pleasant effect, but it also leaves a person feeling the opposite when it wears off. Codeine remains active in the body for about 4-6 hours. Within 12 or so hours after taking it, a kind of “crash” can occur as it processes out of the body, leaving a person feeling irritable and emotionally low. With repeated use, the body can get used to codeine impacting dopamine and neurotransmitter levels, and the brain may then struggle to keep itself balanced without the drug. The National Library of Medicine (NLM) publishes that opioid withdrawal symptoms can then set in, which include physical side effects that are similar to a terrible case of the flu (e.g., sweating, nausea, diarrhea, vomiting, stomach cramps, chills, racing heart rate, watery eyes, and muscle aches). It may include psychological symptoms like anxiety, depression, drug cravings, insomnia, irritability, and agitation. Yawning and dilated pupils are further indicators of codeine and opiate withdrawal. Codeine withdrawal is a sign of drug dependence, which is often a component of drug addiction; however, they are not the same. Addiction is a brain disease that also includes social, behavioral, and psychological symptoms, the American Society of Addiction Medicine (ASAM) explains. One of the biggest hallmarks of addiction is a loss of control over drug use. Codeine can become the center of a person’s life and social circles. Recreational interests and priorities can all change as a result. Relationships can become strained with friends, family, and loved ones. Increased secrecy, unpredictable and explosive mood swings, financial difficulties due to spending money on drugs, and even legal and criminal issues resulting from drug use can be further signs of codeine abuse and addiction. Codeine abuse is optimally addressed through a medical detox program to address physical dependence. Detox should then be followed with a comprehensive addiction treatment program.